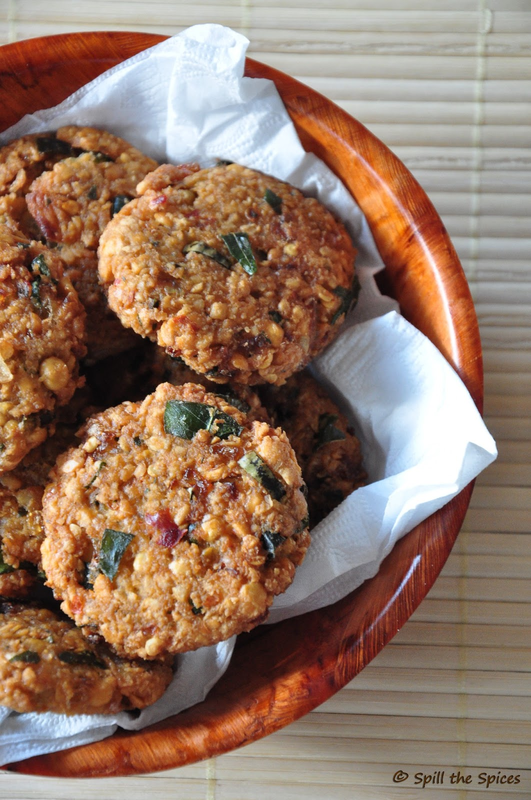 Parippu Vada is a crispy and spicy snack made with toor dal or chana dal or a combo of both dals. Its a popular tea time snack of Kerala. 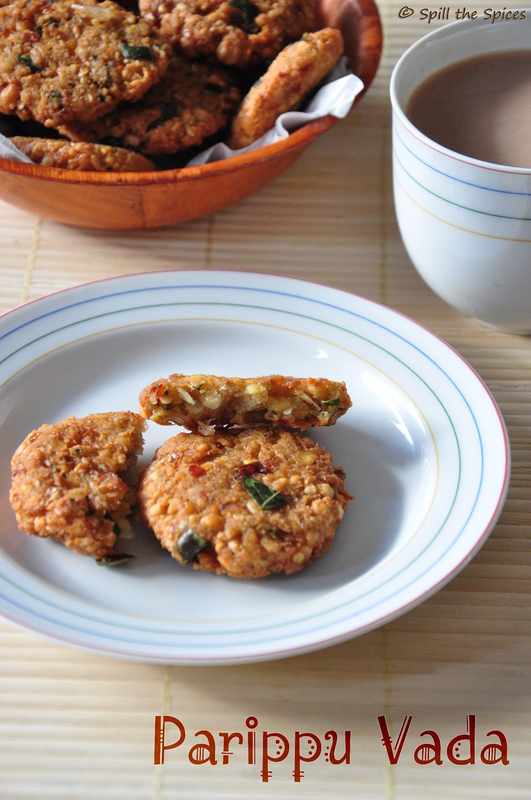 This vada along with black tea, is considered to be the official menu at Communist party meetings! The way this vada is made in Tamil Nadu is different, will share that recipe someday. This is perfect snack to enjoy during cold and rainy days with a hot cup of tea. 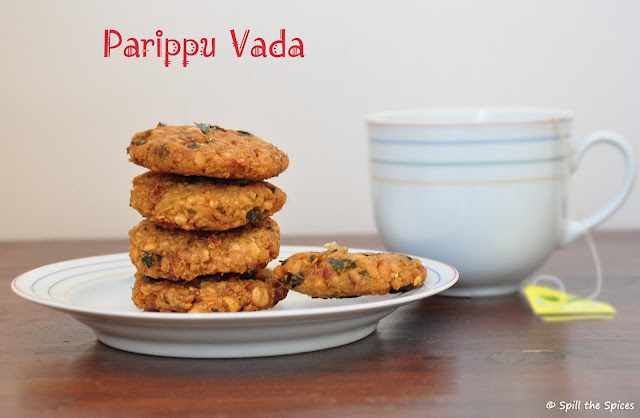 Parippu vada brings back many nostalgic memories. I remember my father used to get me large parippu vadas from a shop nearby his office when I came home during college holidays. Even now, when I go home, he gets me parippu vada. And having no patience to wait to till evening tea, we both enjoy it with lunch! Parippu vada is another reason I love to travel in trains! I could go on with my memories of parippu vada. Let's see how to make this crispy crunchy snack. 1. Wash the dals and soak together for 2 1/2 hours. Drain the water and transfer to a colander and let it rest until water is completely drained. 2. Soak the red chillies in hot water for 15-20 minutes. 3. Grind together the dals, red chillies to a coarse mixture without adding any water. 4. To the dal mixture add shallots, green chillies, curry leaves, hing, salt and mix well. 5. Now divide the mixture into small balls and flatten them gently with your palms. 6. Heat oil for deep frying. When oil is hot, reduce heat to low-medium and gently add the vada. Fry until crispy and golden brown. Drain excess oil in tissue paper. 1. Make sure the water is drained well, otherwise it will be difficult to shape the vada and it will break while frying. 2. Make the vada small and thin to ensure even cooking. 3. After adding onions immediately make vadas. If its set aside, water in onions will make the dal mixture runny. 4. Do not crowd while deep frying and fry in low-medium flame to get crispy vadas. Have tried this last weekend ,it was great ! Yours looks inviting..
Parippu vada looks crunchy and yummy. love this crunchy vadas, perfect for my tea now. they r so yummy n tempting..
wow they look so crispy and delicious.. Beautifully done, who can resist to this crispy beauties. Tempting clicks.. Beautiful & perfect vadas.. I need a rain now to enjoy this with a cuppa chai ! Perfectly made crispy and delicious parippu vada. Crispy and delicious vadas. The pics are so tempting!